The space-based human-rights initiative co-founded by actor George Clooney is now shifting into detective mode. 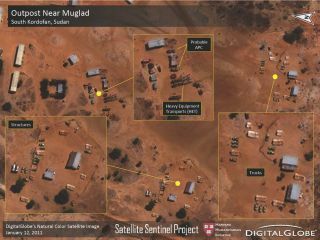 The Satellite Sentinel Project — which has been using spacecraft imagery to monitor human rights abuses in Sudan and South Sudan since December 2010 — will also now conduct investigations, following the money trails that fund genocide and other mass atrocities, Clooney announced during a speech Tuesday (May 20). "Genocide and other human rights crimes are never just spontaneous events. They require planning, they require financing, and they require international indifference to succeed," Clooney said in a statement. "Where is the money coming from, and where is it being hidden? To the extent we can, we want to make it more difficult for those willing to kill en masse to secure their political and economic objectives, and we want to move the needle away from indifference and inaction." The initiative will keep its eyes on Sudan and South Sudan but will also look at other parts of Africa, including the Central African Republic and the Democratic Republic of the Congo, Satellite Sentinel Project representatives said. The group will investigate how the illegal trade in diamonds, gold, ivory and other resources funds the activities of human-rights abusers, with the aim of identifying the people who commit atrocities and facilitate their perpetration, said Satellite Sentinel Project co-founder John Prendergast. "The objective is a comprehensive approach to countering atrocities that involves satellite imagery, forensic investigations, on-the-ground research, and deeper investment in impacting the calculations of policymakers and commercial actors who might possess the leverage to help stop these human rights crimes," Prendergast said in a statement. The Satellite Sentinel Project uses imagery from DigitalGlobe, a Colorado-based company that currently operates five Earth-observation satellites. DigitalGlobe experts help analyze this imagery, then work with the Enough Project to produce reports, which are released to the press and policymakers to raise awareness of ongoing or potential human-rights abuses, Satellite Sentinel Project representatives said.